The case Groves v. Gallant was argued on November 13, 2018, at the Ames Moot Court competition. The judges were Hon. Sonia Sotomayor, Associate Justice, U.S. Supreme Court; Hon. Jennifer Walker Elrod, U.S. Court of Appeals for The Fifth Circuit; Hon. Susan Carney, U.S. Court of Appeals for The Second Circuit. 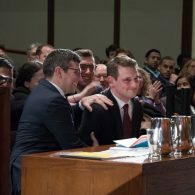 The case Dylan Bloom v. United States of America was argued on November 14, 2017, at the Ames Moot Court competition. The judges were Hon. 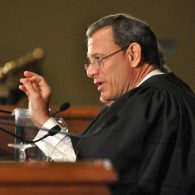 John G. Roberts Jr. '79, Chief Justice, U.S. Supreme Court; Hon. 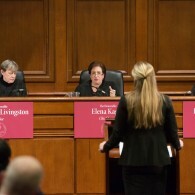 Debra Ann Livingston '84, U.S. Court of Appeals for The Second Circuit; Hon. Carl E. Stewart, Chief Judge, U.S. Court of Appeals for The Fifth Circuit. The case United States v. Papaya Cellular was argued on November 1, 2016, at the Ames Moot Court competition. The presiding judges were Hon. John Paul Stevens, Associate Justice (Ret. ), U.S. Supreme Court; Hon. David J. Barron ’94, U.S. Court of Appeals for The First Circuit; Hon. Alison J. Nathan, U.S. District Court, Southern District of New York. 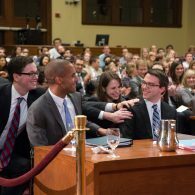 The case Abrams v. Vita, Inc. was argued on November 16, 2016, at the Ames Moot Court competition. The presiding judges were Hon. Elena Kagan ’86, Associate Justice, U.S. Supreme Court; Hon. Debra Ann Livingston ’84, U.S. Court of Appeals for The Second Circuit; Hon. Robert L. Wilkins ’89, U.S. Court of Appeals for The District of Columbia Circuit. 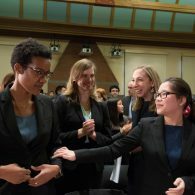 The case Duke v. United States was argued on November 18, 2014, at the Ames Moot Court Competition. The presiding judges were Hon. 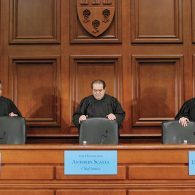 Antonin Scalia '60, Associate Justice, U.S. Supreme Court; Hon. Adalberto Jordan, U.S. Court of Appeals for The Eleventh Circuit; Hon. Patricia Millett '88, U.S. Court of Appeals for The District of Columbia Circuit. The case Jimenez v. Holder was argued on October 23, 2013, at the Ames Moot Court Competition. The presiding judges were Hon. Ruth Bader Ginsburg ’56-’58, Associate Justice, U.S. Supreme Court; Hon. Merrick B. Garland ’77, U.S. Court of Appeals for The District of Columbia Circuit; Hon. Ilana Diamond Rovner, U.S. Court of Appeals for The Seventh Circuit. The case Go Glow, Inc., v. Sheila Simpson was argued on November 15, 2012, at the Ames Moot Court Competition. The presiding judges were Hon. David Souter '61, '66, Associate Justice, U.S. Supreme Court; Hon. Mark Wolf '71, U.S. District Court, Massachusetts; Hon. Reena Raggi '76, U.S. Court of Appeals for the Second Circuit. The case United States v. Garfield was argued on November 17, 2011, at the Ames Moot Court competition. The judges were Hon. 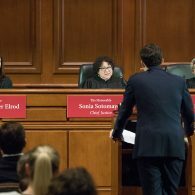 Sonia Sotomayor, Associate Justice, U.S. Supreme Court; Hon. Frank Easterbrook, Chief Judge, U.S. Court of Appeals for The Seventh Circuit; Hon. Peter Rubin '88, Massachusetts Court of Appeals. 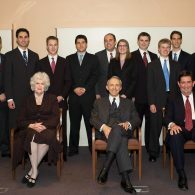 The case McBride v. United States was argued on November 16, 2010, at the Ames Moot Court Competition. The presiding judges were Hon. John G. Roberts Jr. '79, Chief Justice, U.S. Supreme Court; Hon. 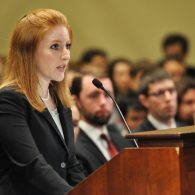 Julia Smith Gibbons, U.S. Court of Appeals for The Sixth Circuit; Hon. Diana E. Murphy, U.S. Court of Appeals for The Eighth Circuit. The case Springfield v. Humans Against the Consumption of Animals (HACA) was argued on November 16, 2009, at the Ames Moot Court Competition. The presiding judges were Hon. Richard A. Posner '62, U.S. Court of Appeals for The Seventh Circuit; Hon. Diane P. Wood, U.S. Court of Appeals for The Seventh Circuit; Hon. Barrington D. Parker, U.S. Court of Appeals for The Second Circuit. 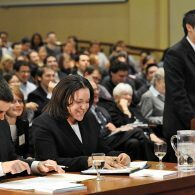 The case Hubbard, Lopez, and Betancourt v. Andrews was argued on November 18, 2008, at the Ames Moot Court Competition. The presiding judges were Hon. 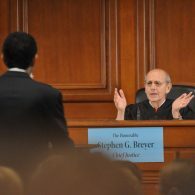 Stephen G. Breyer ’64, Associate Justice, U.S. Supreme Court; Hon. Marsha Siegal Berzon, U.S. Court of Appeals for The Ninth Circuit; Hon. Frank Hull, U.S. Court of Appeals for The Eleventh Circuit. 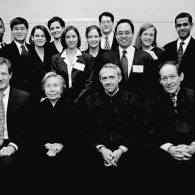 The case Worldwide People's Temple v. Rasmussen was argued on November 14, 2007, at the Ames Moot Court Competition. The presiding judges were Hon. Antonin Scalia LL.B '60, Associate Justice, U.S. Supreme Court; Hon. Carlos Lucero, U.S. Court of Appeals Tenth Circuit; Hon. Debra Livingston '84, U.S. Court of Appeals Second Circuit. 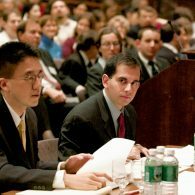 The case Adam's Apple Markets v. Aphrodite Cosmetics was argued on November 14, 2006, at the Ames Moot Court Competition. The presiding judges were Hon. Anthony Kennedy '61, Associate Justice, U.S. Supreme Court; Hon. Diana Gribbon Motz, U.S. Court of Appeals for The Fourth Circuit; Hon. Merrick B. Garland '74, U.S. Court of Appeals District for The Columbia Circuit. 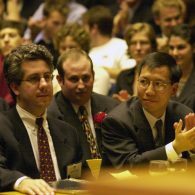 The case McNeil v. Lu was argued on November 17, 2005, at the Ames Moot Court Competition. The presiding judges were Hon. David Souter '61, '66, Associate Justice, U.S. Supreme Court; Hon. Emilio M. Garza, U.S. Court of Appeals for The Fifth Circuit; Hon. Ilana Diamond Rovner, U.S. Court of Appeals for The Seventh Circuit. The case Amy Annis, et al., v. The State of Ames was argued on November 18, 2004, at the Ames Moot Court Competition. The presiding judges were Hon. Ruth Bader Ginsburg '56-'58, Associate Justice, U.S. Supreme Court; Hon. Richard Paez, U.S. Court of Appeals for The Ninth Circuit; Hon. Reena Raggi '76, U.S. Court of Appeals for The Second Circuit. 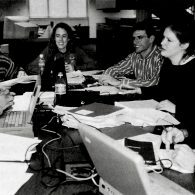 The case Jones v. Oakes and Brooks was argued on November 12, 2003, at the Ames Moot Court Competition. The presiding judges were Hon. Douglas Ginsburg, U.S. Court of Appeals for The District of Columbia Circuit; Hon. Karen Nelson Moore, U.S. Court of Appeals for The Sixth Circuit; Hon. Fortunato Benevides, U.S. Court of Appeals for The Fifth Circuit. 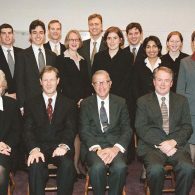 The case Mary Cameron and David Rae v. States of Ames was argued on November 16, 2000, at the Ames Moot Court Competition. The presiding judges were Hon. David Souter '61, '66, Associate Justice, U.S. Supreme Court; Hon. Frank Easterbrook, U.S. Court of Appeals for The Seventh Circuit; Hon. Judith W. Rogers LL.B '64, U.S. Court of Appeals for The District of Columbia Circuit. The case Kim Tan v. Susan Applegale, District Director, United States Immigration and Naturalization Service, City of Ames, Ames was argued on November 18, 1999, at the Ames Moot Court Competition. The presiding judges were Hon. Jon O. Newman, U.S. Court of Appeals for The Second Circuit; Hon. William A. Fletcher, U.S. Court of Appeals for The Ninth Circuit; Hon. Margaret Marshall, Chief Justice, Massachusetts Supreme Judicial Court. The case Ride-A-Long Productions, Inc. and Ames Broadcasting Co., Inc. v. Suzanne Rogers and Michelle Roger was argued in the Spring of 1999. The presiding judges were Hon. Stephen G. Breyer ’64, Associate Justice, U.S. Supreme Court; Hon. Laurence H. Silberman ’61, U.S. Court of Appeals for the District of Columbia Circuit; Hon. Diane P. Wood, U.S. Court of Appeals for the Seventh Circuit. The case Willard Beach Golf Resort INC. v. Champions Greens, INC. was argued on March 18, 1998 at the Ames Moot Court Competition. The judges were Hon. David Souter '66, Associate Justice, U.S. Supreme Court; Hon. Phylllis A. Kravitch, U.S. Court of Appeals for the Eleventh Circuit; Hon. Bruce M. Selya ’58, U.S. Court of Appeals for the First Circuit.